The region of Bojaya is part of the Department of Choco and is located in the Northwest part of the Colombia. 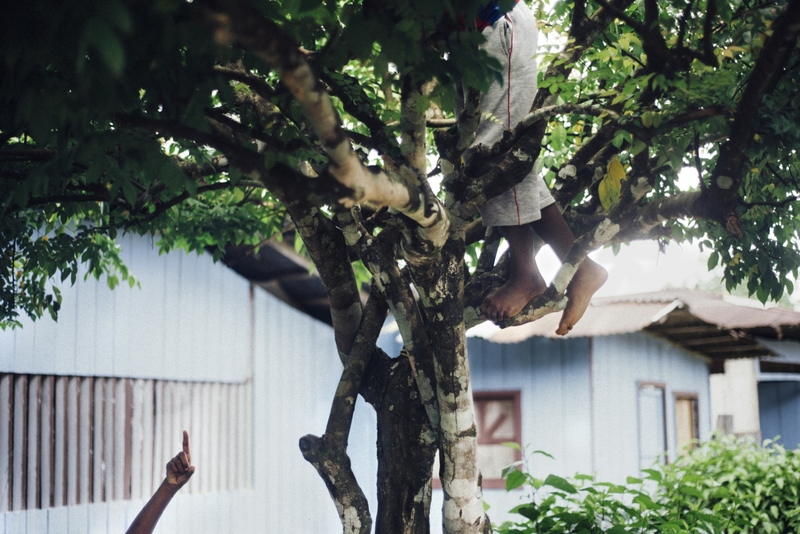 Next to the Atrato river, populated by a dense tropical jungle and home to various Indigena communities, as well as one of the largest Afro-Colombian populations in the country. 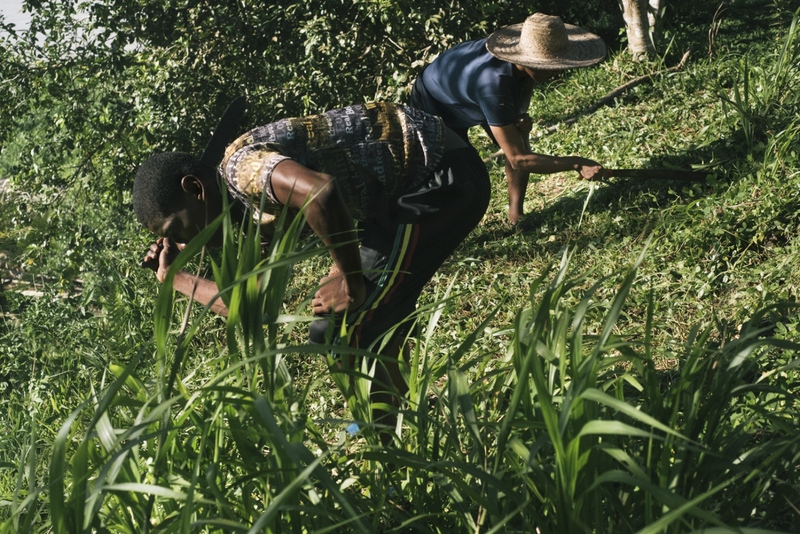 Beginning with its´ history of slavery, Choco has since been disenfranchised and left aside by the centralist Colombian government; the gap between the rural and ruling elite groups has always been wide. This and its remote and isolated location have caused structural problems that have affected the region for decades. It is the poorest department of the country, has one of the highest rates of informality and unemployment, and corruption undermines the legitimacy and efficiency of local authorities towards the government. New Bellavista is the main town in Bojaya, it sits on the bank of the Atrato river, a source of life for its’ communities and an important part of the way locals live, from fishing to traditional mining. At the same time, the Atrato has brought troubles to the region. It is a hotspot for illegal mining and is a strategic location for drug and weapon trafficking, an entry point to Central America and a connection route between the two oceans. 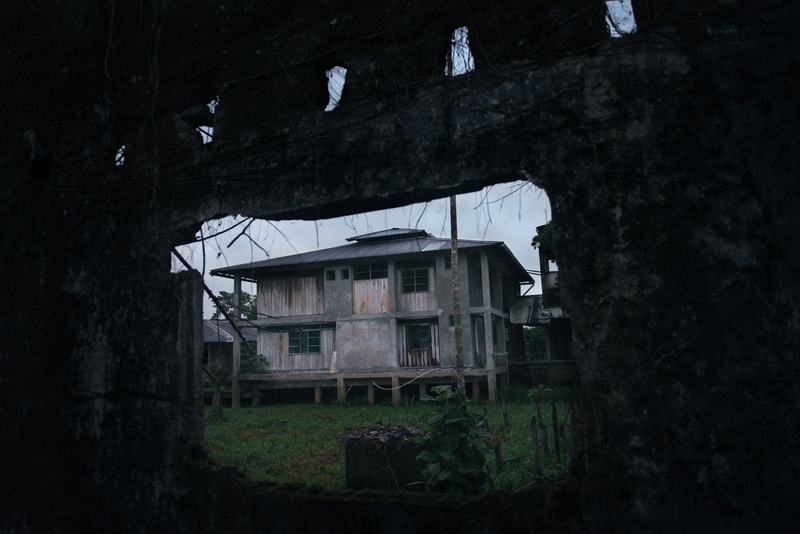 On May 2nd, 2002 Old Bellavista was destroyed during a combat between the 57th front of the FARC (Revolutionary Armed Forces of Colombia), that controlled the town at the time, and the AUC (Autodefensas Unidas de Colombia) paramilitary forces. The FARC launched an improvised gas cylinder mortar that landed in the town church where civilians were taking shelter. The structure was one of the few made out of concrete and it gave a sense of protection to the villagers. Ninety-eight people were wounded and anywhere from 74 to 119 civilians died in the attack, over half of them children. By a wide consensus, the FARC was the main responsible of the massacre, however, the Colombian state was also found guilty. 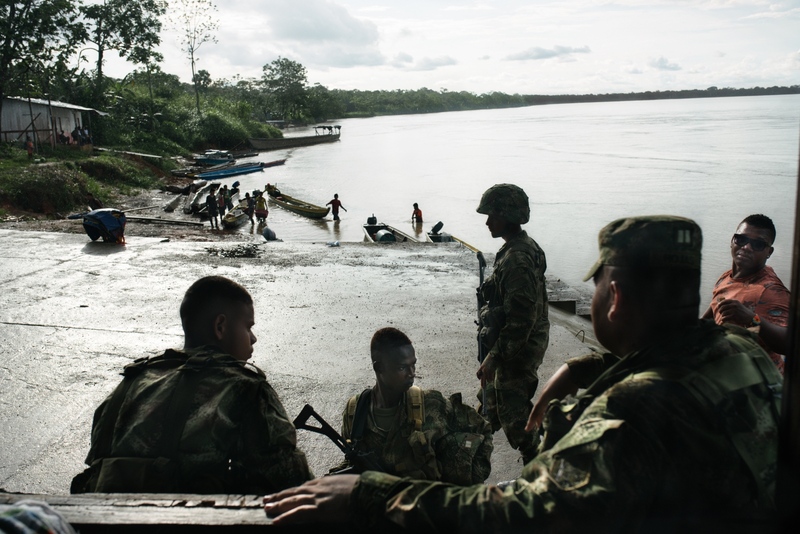 The Administrative Tribunal of the Choco region found that the Colombian nation was administratively guilty of omitting various warnings about the presence of armed groups in the region days before the massacre. Over a decade after the massacre, on October 2nd, 2016, 96% of Bojaya residents voted “Yes” during a nation wide referendum in support of the peace agreement negotiated between the FARC and the government. 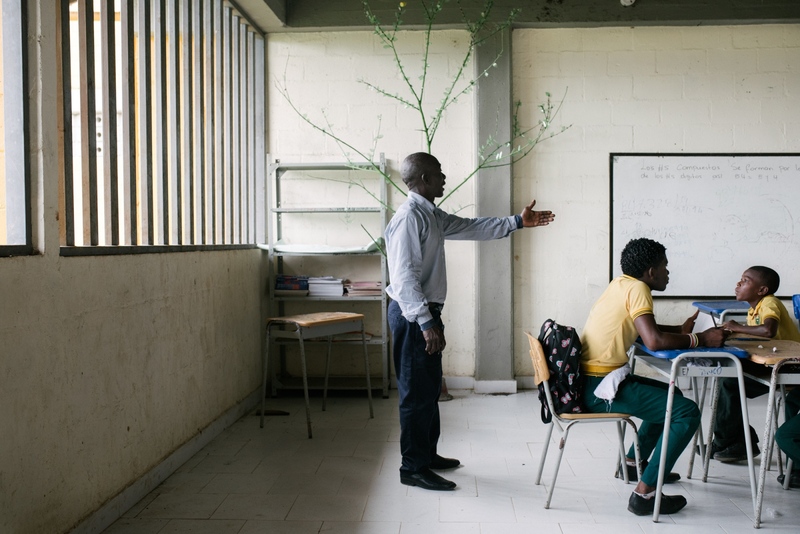 It was one of the highest approval rates in the country and the town became an example of the rural Colombia that suffered the atrocities of war and was ready to say yes to peace and in hopes of a post conflict that could bring change. Although the “No” won by a razor thin margin setting a climate of uncertainty over the future of the peace process, a new agreement that included changes and precessions the “No” promotors asked for, was signed a month on November 24. 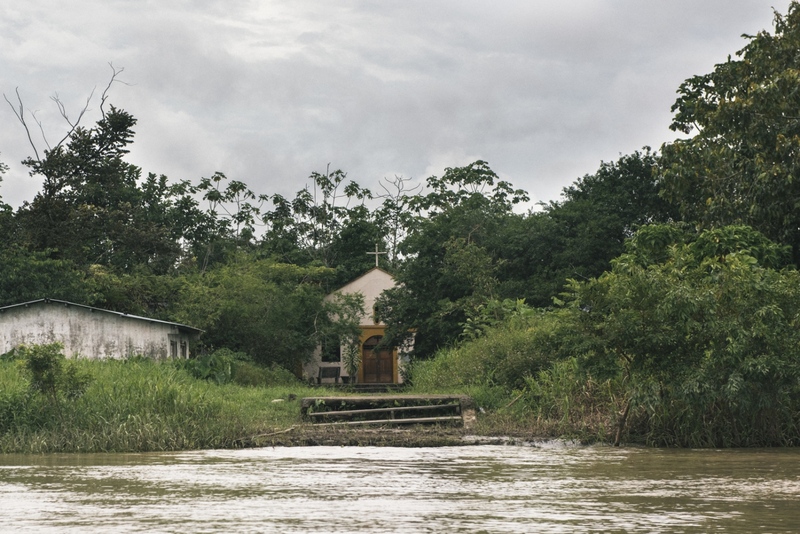 As villagers feel confident in building new homes and planting new crops in some regions of the Atrato, it will be how thoroughly the agreements are implemented what will solve or not issues that have affected Bojaya and the Choco region for decades. El 2 de Mayo de 2002 el pueblo,Viejo Bellavista, Chocó fue destruido durante un enfrentamiento entre el frente 57 de las FARC y el bloque Elmer Cardenas de las AUC (Autodefensas Unidas de Colombia). Ochenta personas fueron heridas y otras ciento diecinueve murieron, mas de la mitad de ellas niños, cuando una pipeta de gas fue lanzada por las FARC y calló en el techo de la iglesia del pueblo donde civiles estaban buscaban refugio. Aunque existe un amplio consenso frente a que las FARC fueron los principales responsables de la masacre el Estado Colombiano también fue encontrado administrativamente culpable ya que omitió varias alertas a cerca de la presencia de grupos armados en la región días antes de los hechos. El hecho pasó a la historia como uno de los capítulos mas cruentos de la historia del conflicto armado en Colombia y se le dio el nombre de “La masacre de Bojaya”, el nombre del municipio donde se encuentra Bellavista. La masacre sucedió ad portas de las elecciónes presidencial del 26 de Mayo de 2002, dándole un empujón a la candidatura de Alvaro Uribe, quien ganarían por un amplio margen con una plataforma que no le apostaba a la paz y proponía una lucha directa contra las FARC. El pueblo fue reconstruido rió arriba durante el gobierno de Uribe, sin embargo las gran mayoría de los habitantes del pueblos se desplazaron a Quibdo u otras ciudades, el tejido social del pueblo quedo completamente destruido y los problemas estructurales que afectan a todo el Chocó aun persisten hoy en día. Catorce años después, el 2 de octubre de 2016y, Bojaya voto 96% a favor del “SI’ en el plebiscito sobre los acuerdos de paz. Fue una de las tasas de aprobación mas altas del país y el pueblo se convirtió en un ejemplo de la Colombia Rural que había sufrido la guerra y estaba lista para decirle si a los acuerdos y a la paz. Aunque el “No” gano el plebiscito por un pequeño margen, un relativo clima de paz y tranquilidad seguía en píe en Bojaya, civiles y FARC convivían sin conflicto en la región. Muestra de esto fue la vigilia por la paz organizada por el frente 57 de las FARC el 31 de octubre en las cercanías del pueblo de Pogue. La vigilia, que fue convocada por la guerrilla como gesto de buena voluntad cuando el cese al fuego bilateral tenia como fecha limite el mismo 31 de octubre contó con la asistencia de alrededor de doscientas personas. Alrededor de un mes y medio después del plebiscito, la segunda versión de los acuerdos fue aprobada por el Congreso de la República. Es aun incierto si el post conflicto solventará o no lo problemas que han afectado a la región por décadas. 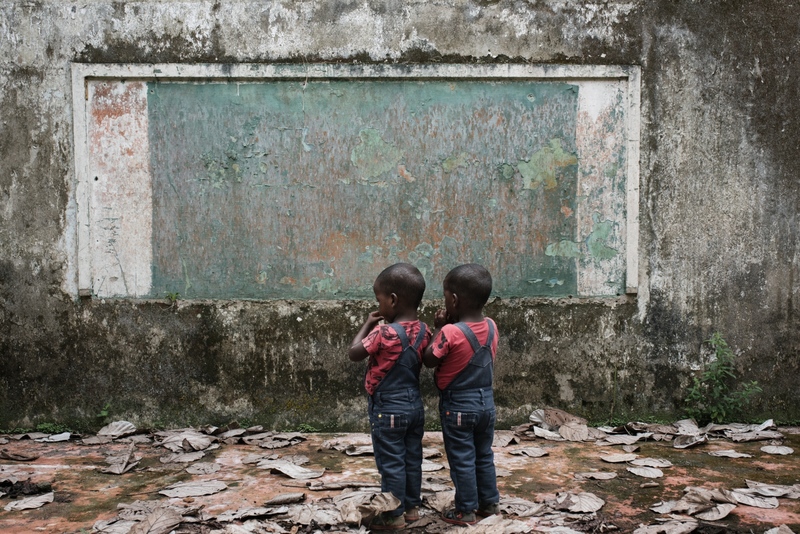 Two twins stand in front of what was once the chalkboard of one of the classrooms of Old Bellavista. May 2nd, 2017. Old Bellavista, Bojayá, Colombia. The remains from many of those who died during the massacre of May 2nd lay at a graveyard at Bellavista. Soon, the last bodies will be exhumated and the graveyard rebuilt and improved. May 4th, 2017. New Bellavista, Bojayá, Colombia. 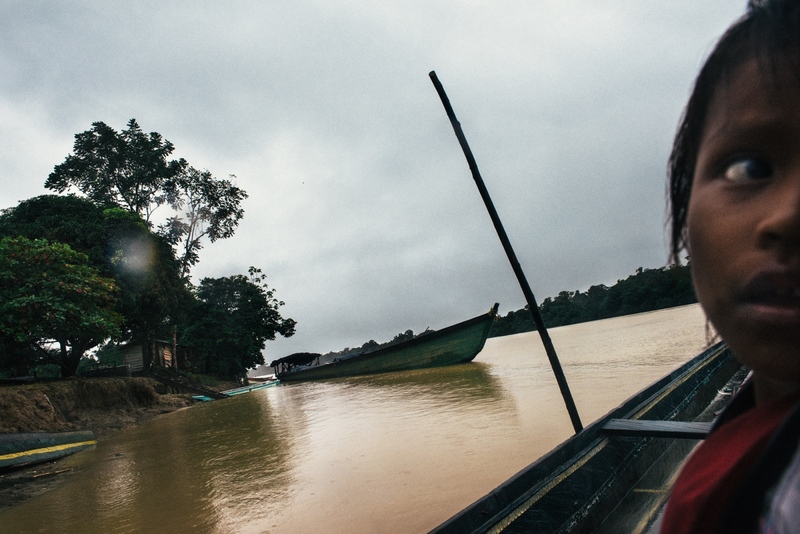 In the north-western region of Chocó, Colombia, the many rivers, and their affluents serve as the main way of transportation. Large amounts of gasoline are needed to get to communities located hours away from any urban center, making transportation extremely costly. 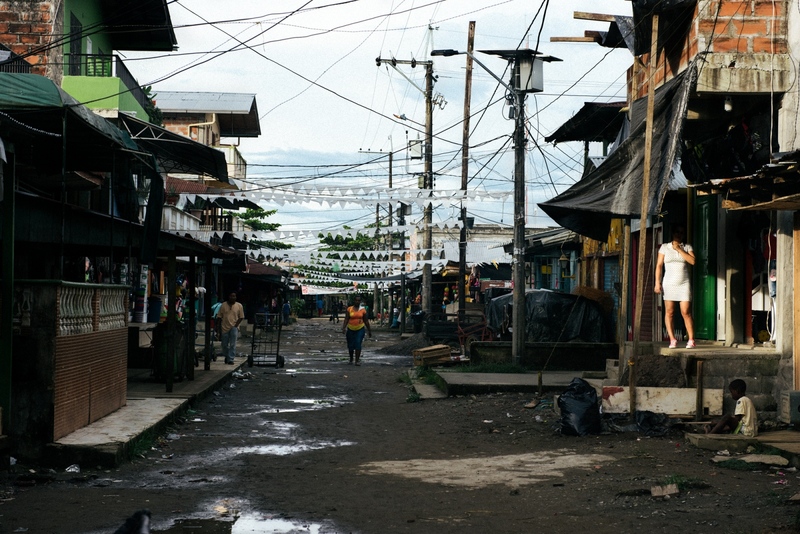 The lack of infrastructure is among many other factors that make it harder for Chocó to overcome the stagnant social and economic hardship in which it has being through for decades. The Chocó, as much of Colombia is majoritively Christian. Years ago the church played a strong role in the life of Old Bellavista. After the massacre and with the passage of time the community started to attend less to church as it did not effectively reconstruct the social knit of the community. However, each year, a mass happens in front of the graveyard in remembrance of all of those who have died. 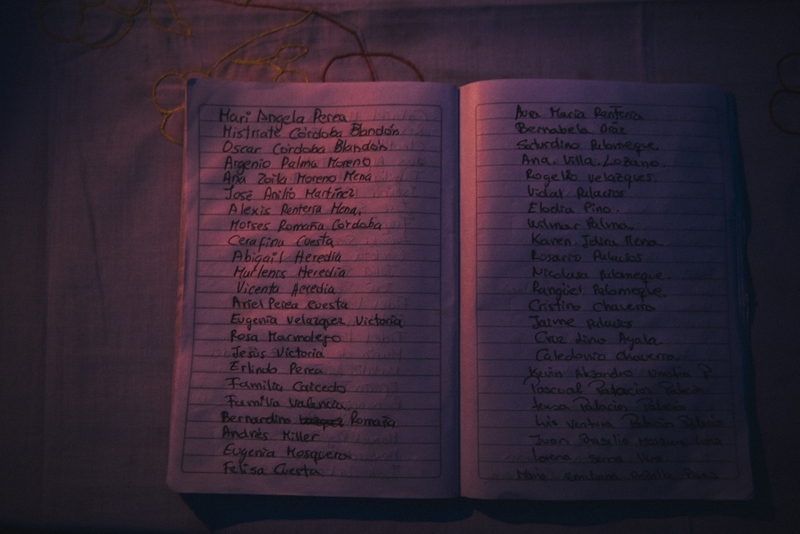 A notebook used during the mass for the remembrance of the dead ones contains names written by friends and relatives of the people who have recently died and of those who died during the 2nd of May massacre. 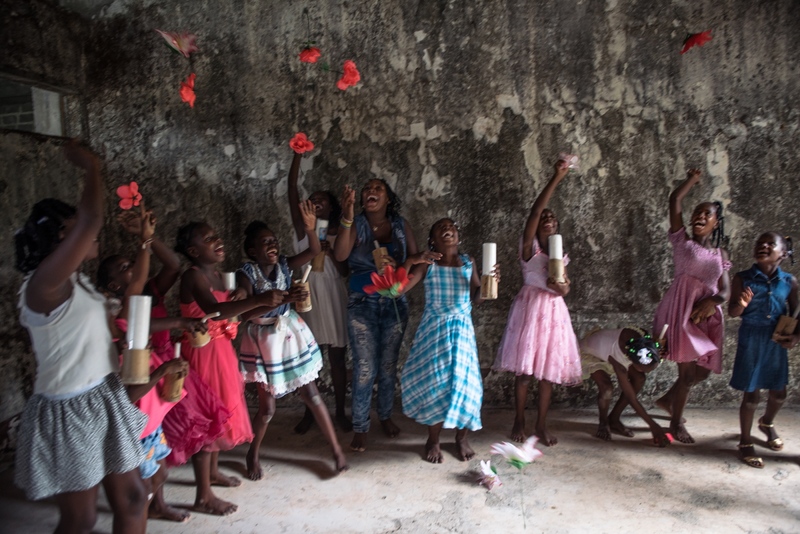 Afrocolombians and members of the Embera community observe a minute of silence during the FARC's vigil for peace on October 31st 2016. 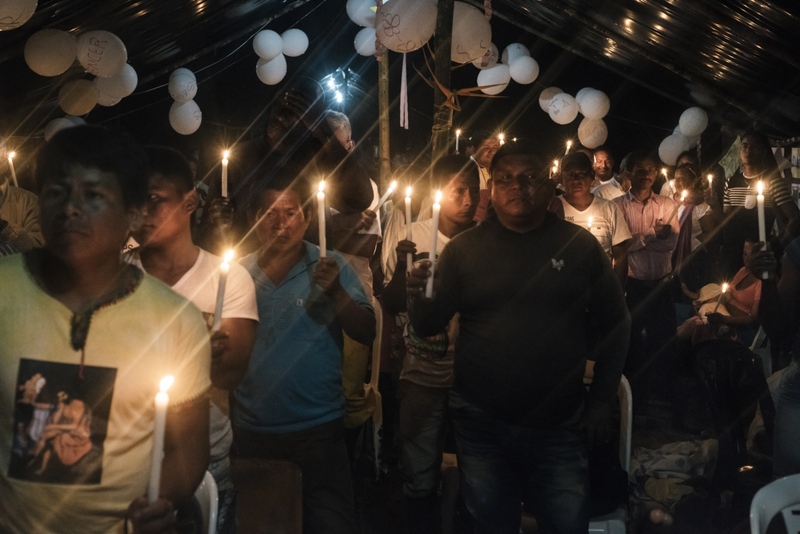 The vigil opened the door of all of the FARC camps to civilians and anyone who wanted to attend, it was organized by the FARC to reiterate their willingness to keep negotiating with the government after the "NO" won in the "Plebiscite for the peace" on October 12th. 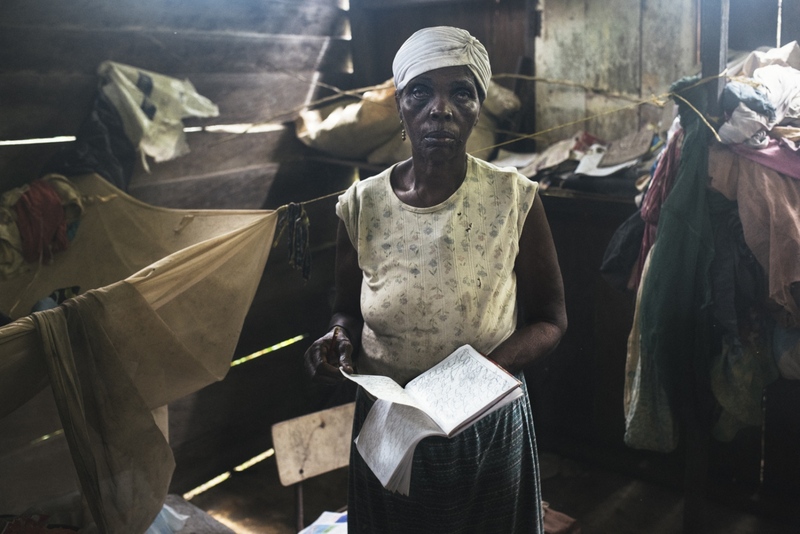 In Chocó only 10 percent of the land is owned by privates, the other 90 percent are commons that belong to black communities, indigenous reservations and are inalienable, imprescriptible and undistrainable. 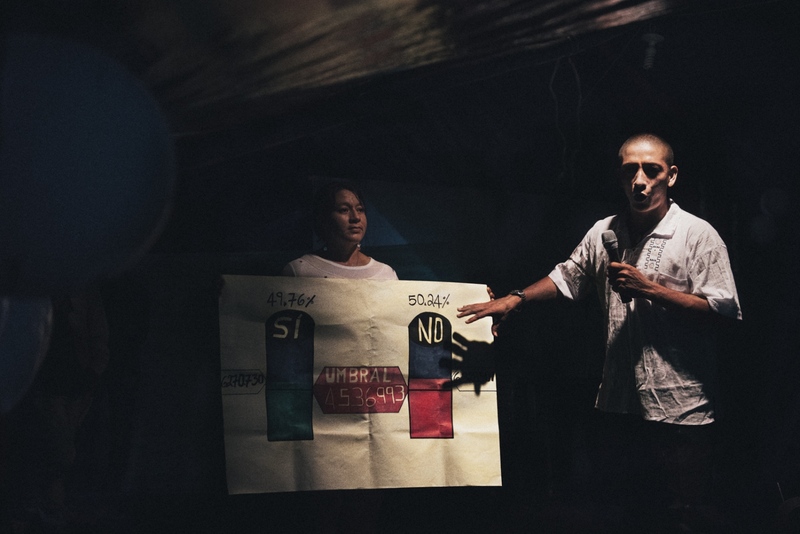 FARC members explain the result of the peace agreement referendum in which the "NO" won by a thin margin. 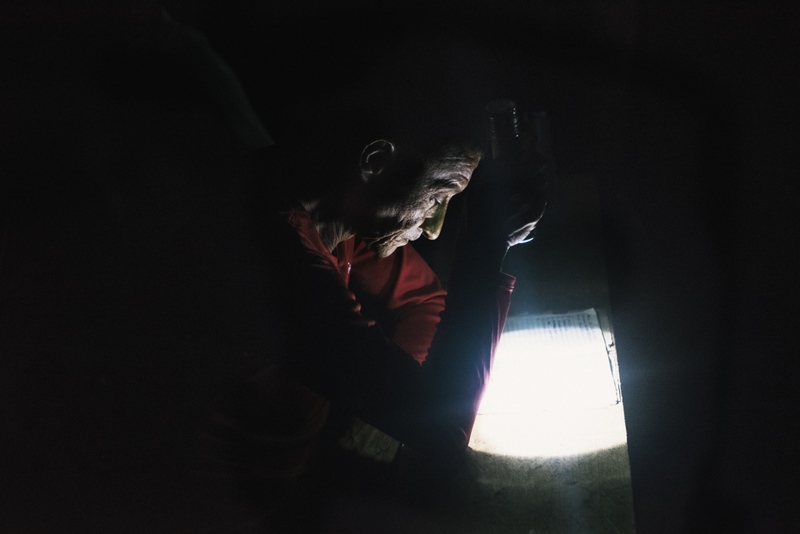 A FARC members checks the list of those who have entered the part of the camp where guerrillas spend the night. 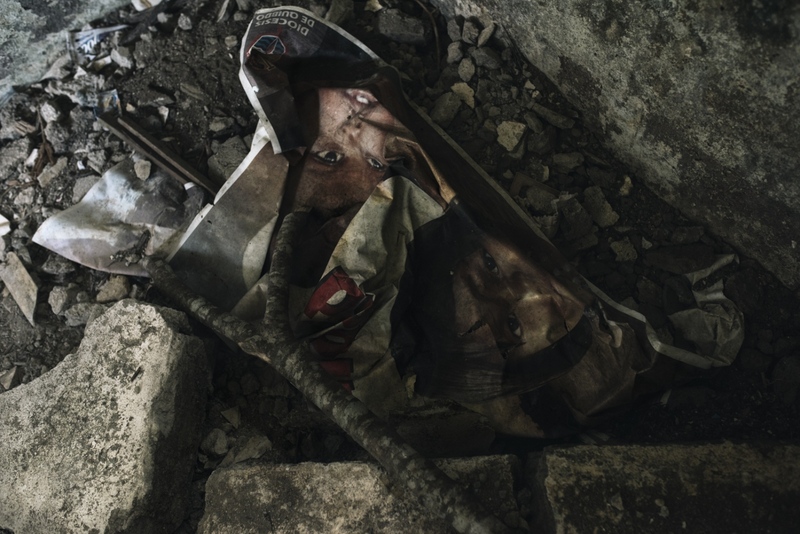 A wrinkled print of the faces of two children lays in the ruins of one of the buildings next to the church of Old Bella Vista where on the 12th of May, 2002 from 74 to 119 civilians died while taking shelter after FARC forces launched an improvised mortar amidst a confrontation with the paramilitary forces of the United Self-Defense Forces of Colombia. Minelia, who is mentally challenged, survived the May 2nd massacre and helped the wounded through the night, providing them with water and first aid. November 4th, 2016. New Bellavista, Bojayá, Colombia. 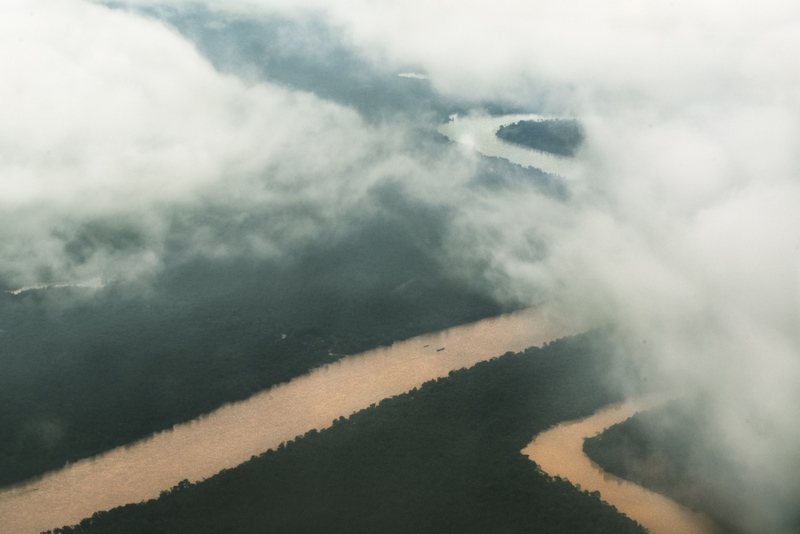 The Atrato river is one of many that run across the dense jungle in Chocó. Soldiers from the Colombian army guard the docks of Bellavista, there is widespread mistrust for the army in the region as the paramilitary leader "El Aleman" has testified that he and his men received support from the army so they could get to Old Bellavista in the days prior to the massacre. May 1st, 2017. Bellavista, Bojayà, Colombia. José Froilan poses for a portrait. Froilan was at the church on May 2nd, 2002 when the FARC launched an improvised mortar that landed in the ceiling of Old Bellavista's church. He survived but lost two of his children and his wife who were also looking for shelter inside the church. He suffered several injuries that have caused him severe medical problems through the years. 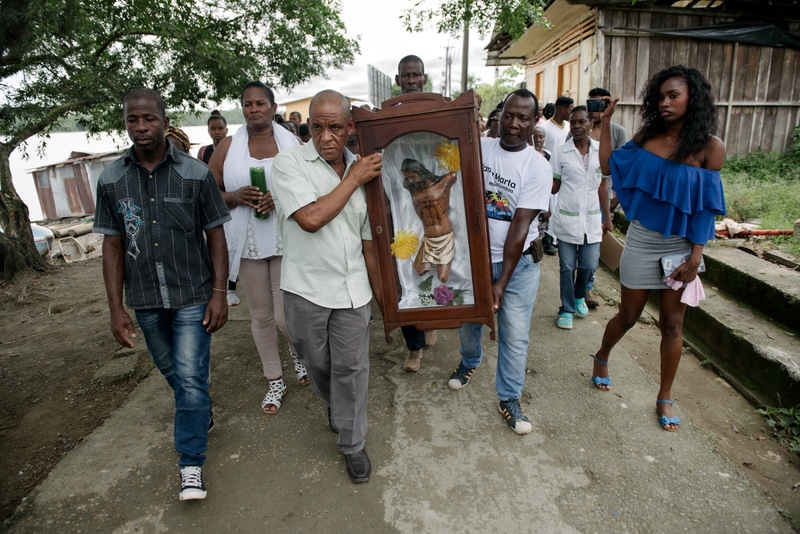 Locals from New Bellavista carry "the mutilated Christ" at Vigia del Fuerte, the town that gave them shelter after the FARC perpetrated a massacre at Bellavista on May 2nd, 2002. The remains correspond to the Christ's statue that was at the church where 79 people died during the massacre of Bojayá. May 2nd, 2017. Vigia del Fuerte, Bojayá, Colombia. On the night of the 12th of May, 2002, an improvised mortar was launched by paramilitary forces amidst a combat with the FARC's 57th front for the control of Old Bellavista. The mortar landed in the town's church ceiling killing from 74 to 119 civilians. 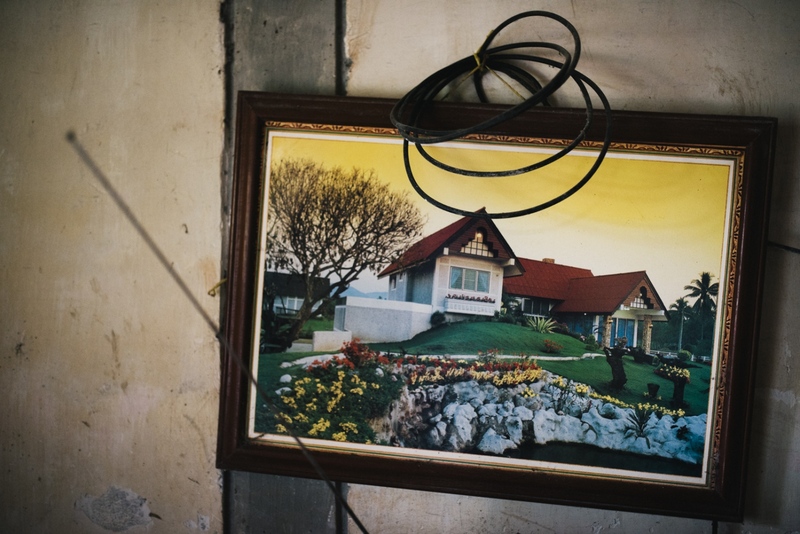 The massacre caused a wave of mass displacement and the town was abandoned. 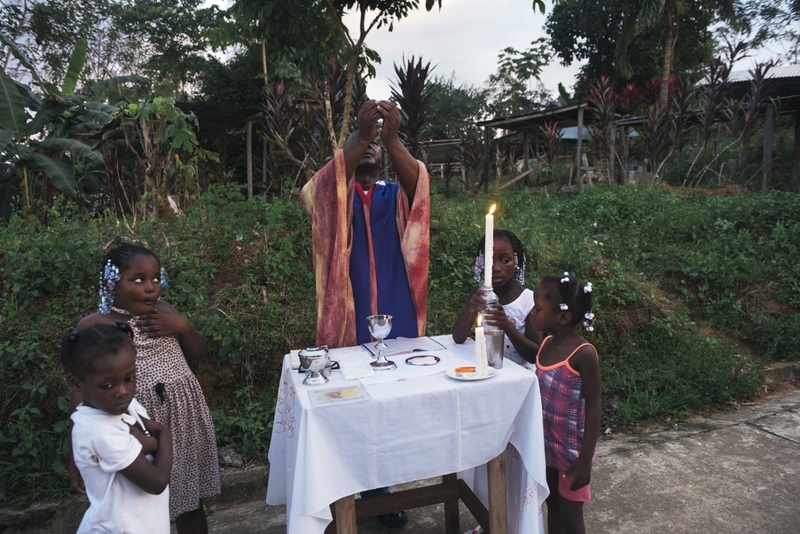 The church has now been rebuilt and is a community center. 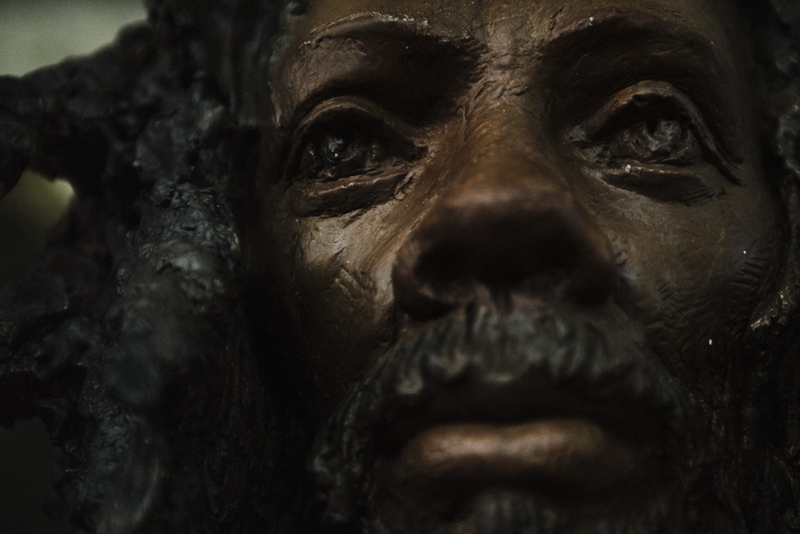 The face of the black Christ that was gifted by the FARC to Nuevo Bella Vista as a symbol of forgiveness and reparation. A painting hanging in a house in New Bella Vista. "Not to war!" scream a group of girls while rehearsing an act they performed at one of the ceremonies for the remembrance for the Bojayá massacre of May 2nd, 2002. May 2nd, 20017.Old Bellavista, Bojayá, Colombia. The town of Vigia del Fuerte its located on the other shore of the Atrato river, close to New Bella Vista. 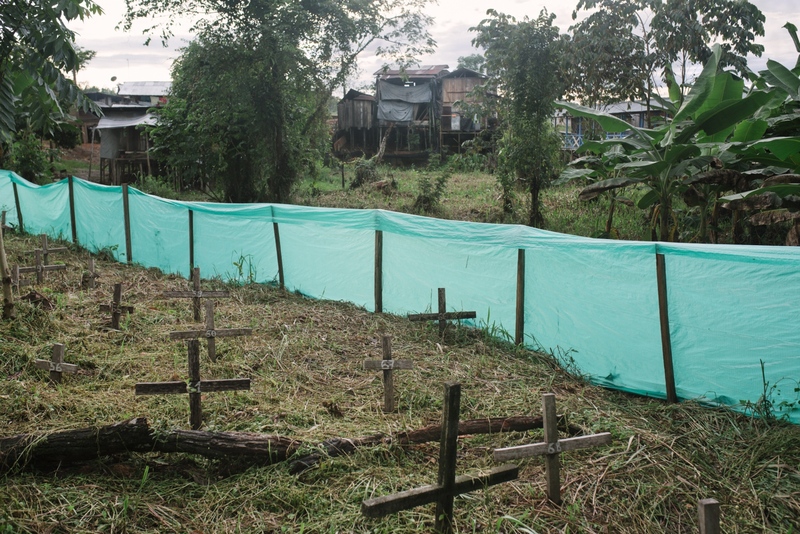 The town was seized by the Farc in 2001 for its strategical region and 31 people were killed. 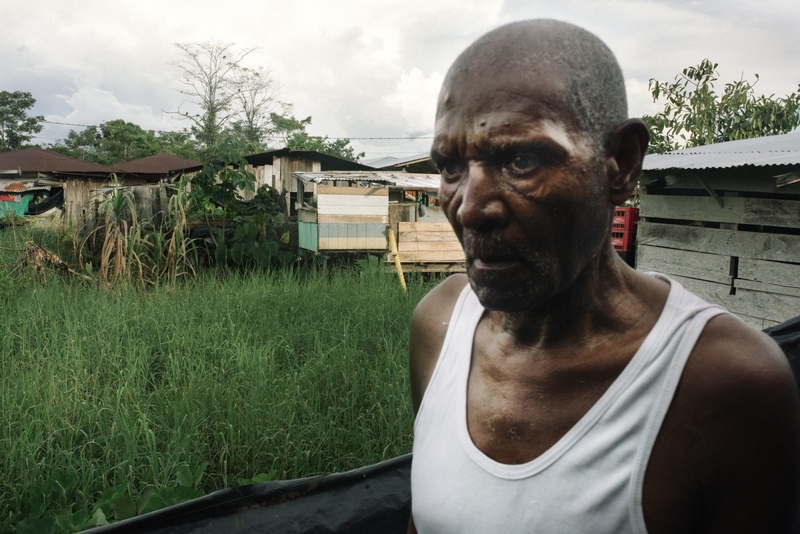 Nowadays locals are worried because of the presence of organized crime groups and paramilitary forces in Vigia del Fuerte, particularly because members of the FARC have expressed their interest in coming back to the region after reintegrating into society. 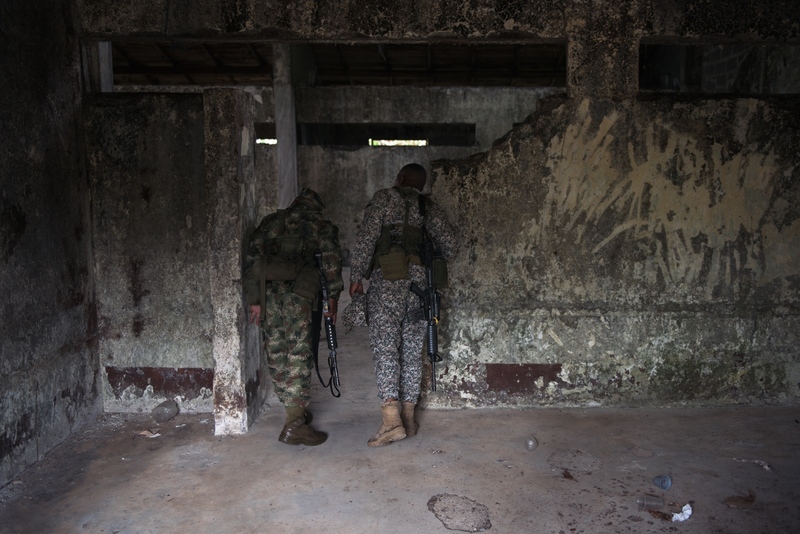 Two Colombian soldiers look out of a wall in one of the many destroyed buildings of Old Bellavista. Old Bellavista, Bojayá, Colombia. May 2nd, 2017. Two students from 11th grade do their social work cleaning the grass of an observation deck in New Bella Vista. 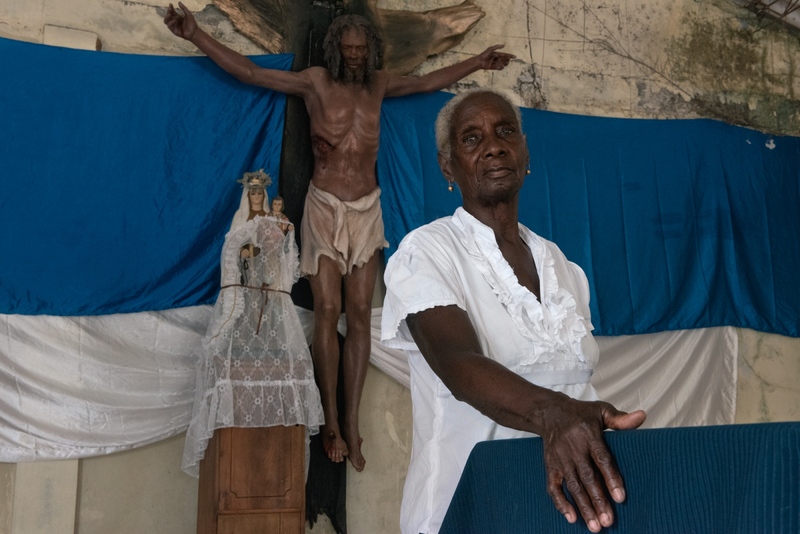 Ceneida Mena poses for a portrait in front of a black Christ that the FARC gifted to New Bellavista. However, the Christ was not well received in town and it had to be taken to La Loma where residents agreed to receive it in their church. Ceneida's son was the first victim of paramilitary violence in La Loma, he was killed in a bar. She still does not know the reason why they killed him. She believes that the FARC should repair the damage they have done in more concrete and less symbolic ways. 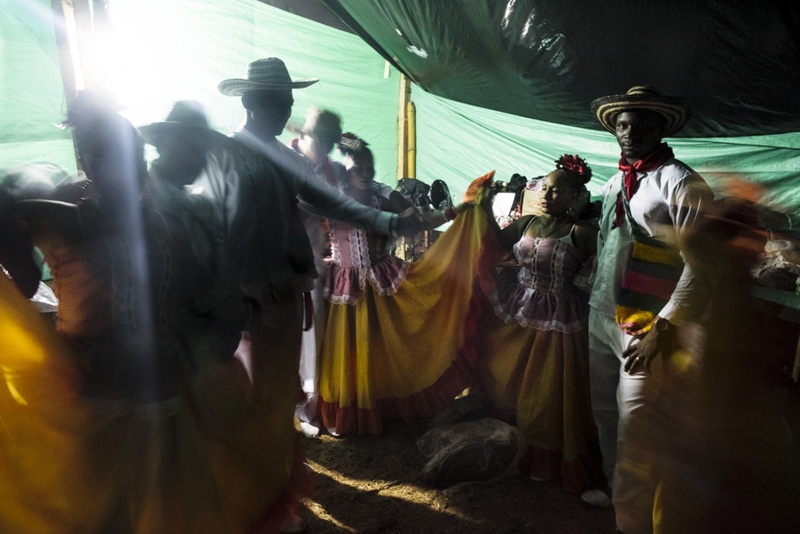 FARC members dressed in traditional dresses, rehearse before going on stage and dancing for the communities of Bojayà. 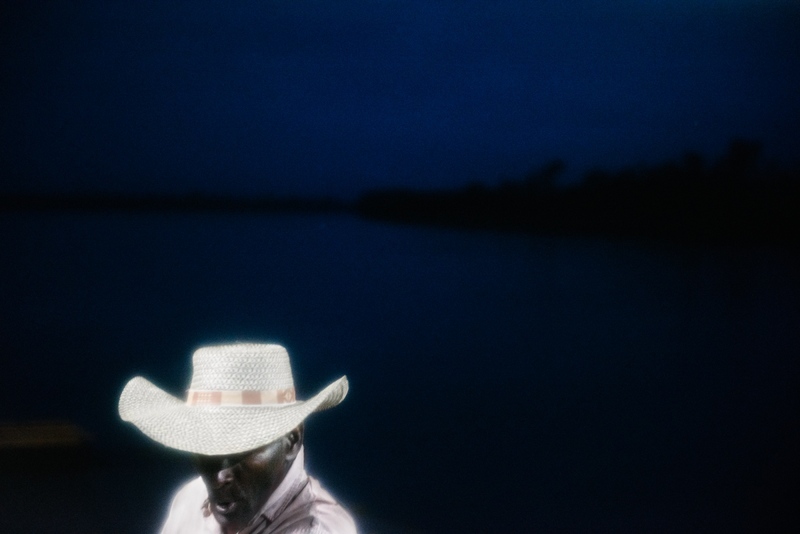 Tomas Mantilla is a photojournalist documenting human rights topics and issues of social concern. He is based in Bogotá, Colombia.